Golf season is right around the corner! 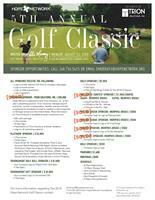 Attached is the sponsorship form for this year’s Hope Network Golf Classic at the Oakland University Golf & Learning Center. Hope Network offers a wide variety of programs with a focus on autism, special learning, childhood learning, mental illness, and others. The event will be held on Monday, August 13th, and both courses will be used this year event (The Sharf & Katke-Cousins) so sign up quick to reserve your group for a great day of golf & networking. Event hosted by Eddie Murray, former Detroit Lions kicker.